Undead creatures have terrified villagers and popular audiences for centuries, but when analyzed closely, their behaviors and stories—however farfetched—mirror our own in surprising ways. The essays collected in this book are as humorous as they are thoughtful, as culturally relevant as they are economically sound, and provide an accessible link between a popular culture phenomenon and the key concepts necessary to building one’s understanding of economic systems large and small. 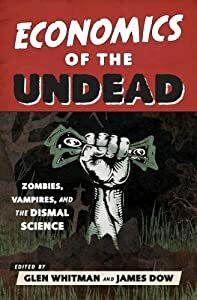 It is the first book to combine economics with our society’s fascination with the undead, and is an invaluable resource for those looking to learn economic fundamentals in a fun and innovative way. The book was edited by Glen Whitman and James Dow, professors of economics and finance (respectively) at California State University, Northridge, with chapters written by the editors and 26 other authors working in economics and related fields (including a couple of lawyers and literature professors). The chapters represent a variety of economic perspectives as applied to the living dead. On this website, you can browse the table of contents (with chapter summaries), read selected excerpts, and see the course guide for recommended chapters for use in economics courses. You can also visit the blog for current events and further discussion about economics and the undead.